The symbol of a horse was chosen to represent the Spanish mustangs that live on our northern beaches which are one of the largest herds still remaining in the wild. The wings were added to incorporate the element of flight and tie into the First Flight Centennial Celebration. Clever craftsmen and artists from the Outer Banks used the horses as blank canvases and created true works of art. 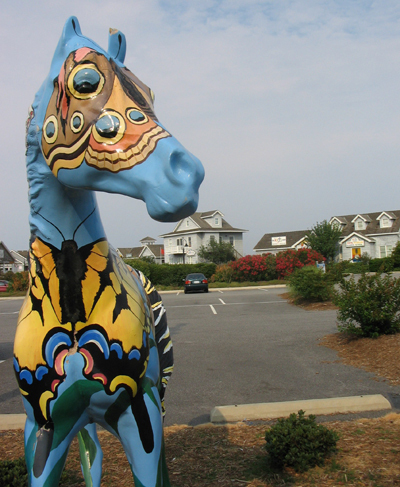 These horses can be seen at schools, businesses and welcome centers all along the Outer Banks. The funds that were raised went to support the Monument to a Century of Flight in Kitty Hawk and the Corolla Wild Horse Fund. The Monument to a Century of Flight is a moving site of 14 pylons recognizing significant accomplishments in aviation. The Corolla Wild Horse Fund helps to protect and preserve the remaining horses while allowing them to live in the wild. 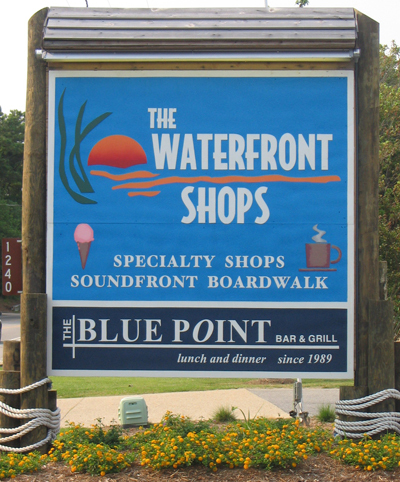 Donna’s entry in the Winged Horse Extravaganza, “Horsefly,” has its home at the entrance to the Waterfront Shops in Duck, NC. It has a wild butterfly theme and draws shutterbugs daily to photograph this beauty. Look closely and you will see that the tail is a monarch caterpillar!